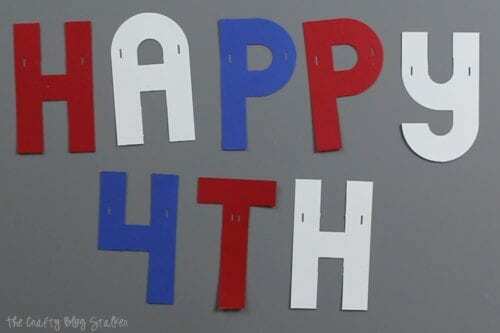 Make a simple 4th of July Banner perfect for Independence Day. You’ll learn how to use the Alphabet Punch Board and link the letters of the banner together. Do you go BIG for Independence Day? Or maybe, you usually don’t decorate but want to do a little something to show your patriotic side? 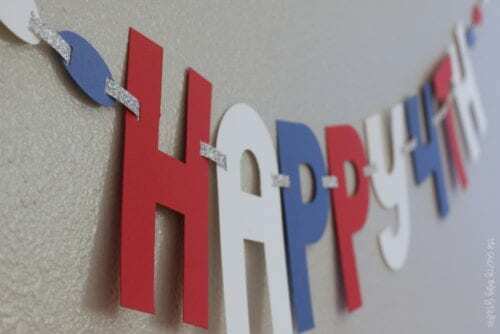 Either way, this Happy 4th of July Banner is going to be the perfect touch to your red, white and blue celebration! If you are new to the Alphabet Punch Board, this is seriously one of the coolest tools! You can cut all 26 letters of the alphabet, numbers 0 through 9, plus an exclamation point (!) and an ampersand (&)! All pieces start out with a rectangle of cardstock that measures 3 x 5 inches, then with a couple punches or a swipe with the blade you have a finished letter or number. So cool! The punch board comes with a handy dandy little manual to help you make all of the pieces so there is no guessing involved. 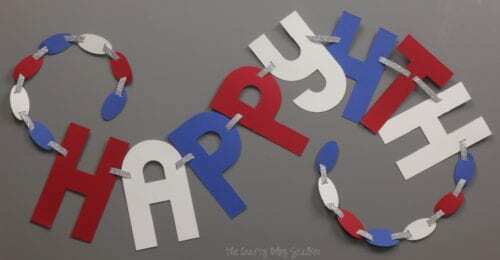 My banner today is going to say Happy 4th, how easy is that? I start by punching all of the letters I need while repeating the color pattern red, white then blue. To connect all of the letters I am going to use the link punch and punch out a bunch of links out of silver glitter paper. Since it’s the 4th, a little sparkle fits in perfectly. The link punch also punches the holes that the links go into, and has a guide so you can perfectly place those holes. Each letter gets a hole punched on the left and right side. The letter T is a little bit difficult since the link punch doesn’t work because of the shape of the letter. So for the T, I used the number 4 as a guide and cut my own holes using a craft knife. It’s a simple fix and only takes a couple extra minutes. All of the letters have their holes punched for the links, and you can see the banner is coming together really pretty quickly. Next, we connect the letters with the glitter links we punched earlier. They are a tight fit so be careful not to tear them, but once they are inserted they are very secure. I wanted a little extra space between they and the 4 since there would be a space between the two when writing them out in a sentence. to create the extra space, cut the ends off of two links. Using a glue dot adhere one to the other, giving you a longer link. Another easy fix. Double links also need to be created to attach the letter T on both sides as well. This will keep regular spacing between the letters on both sides so there isn’t any overlapping. To hang the banner you can string twine or ribbon through the holes on each end of the banner, BUT I really like the link look so I am going to carry that throughout the banner, even the ends. 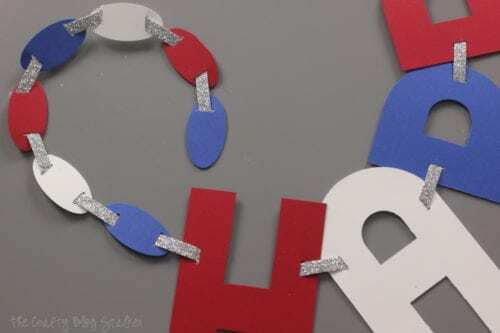 To do that, use a small oval punch and punch out several ovals out of the red, white and blue cardstock. The link punch will create the holes on each end of the ovals. Then use those same glitter links to attach all of the ovals. I made sure to continue the red, white and blue color pattern so everything flowed nicely. The finished banner is super cute, and the whole thing came together so quickly! It looks great hanging on my wall! And seriously, this banner was so easy that I will just toss it in the recycle bin after all of the partying and make a new version next year. Now that’s my kind of decorating! How do you decorate for the 4th of July? Share and comment below! Super cute banner. I love anything 4th of July! Thank you Charlene, I am so glad that you like my banner! Very fun banner and very fun tool! Never heard of an Alphabet Punch but it’s probably a lot faster than tracing stencils. Visiting from Bewitchin’ Projects. Thank you Edye, I am so glad that you like it! Love this! Will have to try it with my Cricut. Really like the link punch thought looks like it makes things so much easier. I am so glad that you like it Melissa! I would love to see what you come up with using the Cricut. That’s a great idea! What a sweet banner to help decorate for the 4th! Love it! I am so glad you like my Happy 4th Banner, Tammy. It was a lot of fun to make! I’m likin this alphabet punch board! Thanks for linking up to Merry Monday! Pinned! Have a great week! Thanks for the Pin, Kim! The Alphabet Punch Board is pretty fun! Thank you Crystal, I am so glad that you like it!